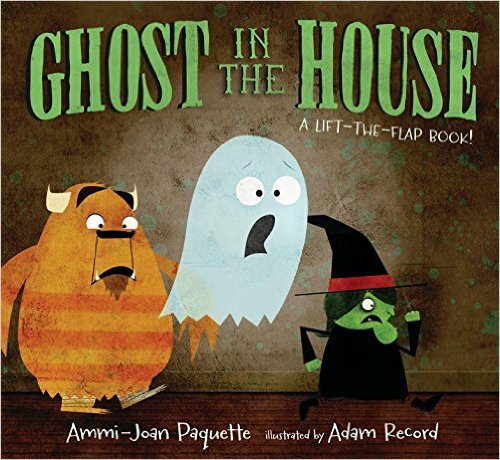 Ghost in the House by Ammi-Joan Paquette with illustrations by Adam Record is the perfect book for little listeners just getting the hang of Halloween. First of all, it is a lift-the-flap book, which is always a treat. On top of that, the flaps are cleverly placed and lift to reveal the source of the spooky sounds and sights in the night. Finally, Ghost in the House practically sings itself, a jaunty rhyme rising and falling with the action on each page. Add to that Adam Record's slightly retro, very funny illustrations and you have the perfect Halloween book! What does he hear? Well, you have to lift the flap to find out! The ghost fretfully floats through the house, tackling his fears and finding other frightened creatures of the night (a mummy, a monster, a skeleton and a witch) at every turn - until they find the scariest thing of all. A little boy. A perfect ending to the perfect Halloween book! If you are going to buy only one Halloween book this year (and you already own Room on the Broom by Julia Donaldson, The Hallo-weiner by Dav Pilkey and One Halloween Night by Mark Teague) Ghost in the House is the book for you shelves! For more great Halloween must-haves, be sure to read this post and this post!